Ever been on a walk or to the playground and come home with no souvenirs? Yea, me neither! My kids love to find ‘treasures’ when they are out and about. Let’s just say they take the saying ‘Another man’s trash is another man’s treasure’ to heart. I love how they see the worthiness of the littlest of things. One particular item always makes the souvenir cut, and that would be the good ol’ rock. Yes rocks….we could start a serious collection with what makes it home. 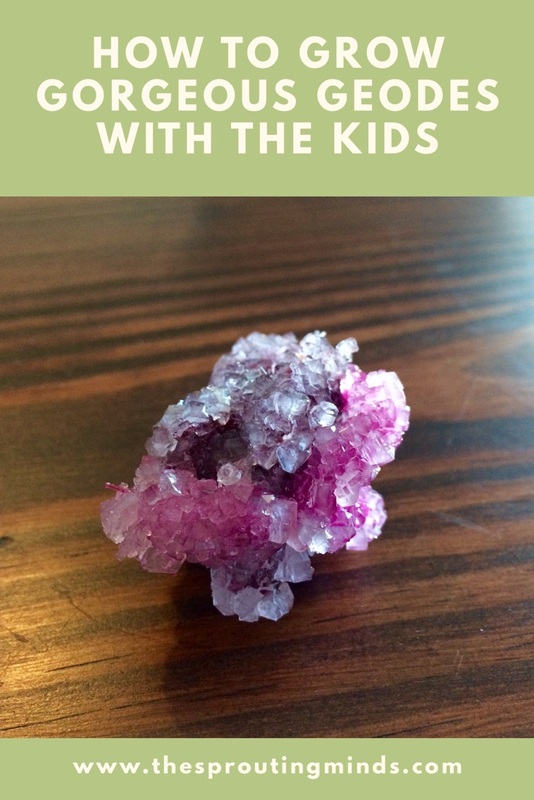 This fun ‘sciency’ activity is perfect for all those who love rocks and all things shiny…growing geodes! What is a geode? According to Carol Moore of Magic Keys, a geode is a round sedimentary or igneous rock that has a hollow cavity lined with crystals. They can be found out in nature as solid looking rocks. When broken open, you will see the hollow cavity lined with crystals. Geodes are normally found in animal burrows or tree roots as well as in the bubbles of volcanic rocks. So basically a hollow area. It can take hundreds of million years for a geode to be created. How crazy, huh?! Well, we will be growing our very own geode in less than a day! Now for the fun part, growing our own geodes! You can easily find the items needed at your local dollar store. Can we say ‘win’? This activity does require adult supervision since you will be working with boiling water as well as some patience for the growing of the geode. First step will be adults only: bring about 2 cups of water to a boil. While the water is boiling, you can have your child/children pick which pipe cleaners they want to use. The color of the pipe cleaner will be the real color determinant of your geode. The more dense the pipe cleaners, the more spherical the geode will be. Crystals will grow on the pipe cleaner either way. If you have a child that is determined to grow crystals on a heart shaped pipe cleaner, then go for it! Once the pipe cleaner is shaped, it will need to be attached to the popsicle stick/wooden skewer with the fishing line/gifting ribbon. Now that your pipe cleaner(s) are shaped, you can have your younger scientist(s) measure out the borax into the glass measuring cup or Mason jar. We decided to use a Mason jar since the mouth is much smaller and could hold our popsicle stick. By this point, your water should be about to boil or boiling. When the water begins to boil, have your child add food coloring to the already measured out borax-this is if your child is wanting to add food coloring. The food coloring just adds a little extra coloring and is not the color determinant. Now, the next step is for the adult: remove the boiling water from the stove and pour into the glass measuring cup/mason jar. If your child is capable, you may have them stir. The borax should dissolve easily. Once the borax is dissolved, place the pipe cleaner attached to the wooden skewer/popsicle stick into the solution. The pipe cleaner shouldn’t touch the bottom or the sides of the glass. Once the pipe cleaner is added, place a dish towel over the top. This will help control the evaporation and adin the growth of your geode. The waiting game now begins. Your geode will take atleast 6 hours or overnight to grow. Some advice on this whole patience and waiting thing….if your child/children don’t do well with waiting for that long and your sanity is already in question, wait and do this project at the end of the day. The longer you let it ‘grow’, the bigger your geode will get. It seriously takes about 5-7 minutes to prep! My kids started their geode right before dinner. This way, it could just rest all evening and overnight. When they woke up, they were super excited to find a geode waiting on them. Yay for shiny rocks that were made at home! Below you will find a few worksheets for furthering your geode activity. I hope your little scientist(s) enjoy!